The word scoliosis comes from the Greek word meaning crooked. The spine (back) should look straight, up and down, when you look at someone from behind. If the spine has a sideways curve, it is called a scoliosis. If you look at someone from the side, normally there are three slight front-to-back curves in the spine - one in the neck, one in the chest section, and one in the lower back. An abnormal more pronounced front-to-back curve is called a kyphosis. This is different to a scoliosis. What causes and types of scoliosis? 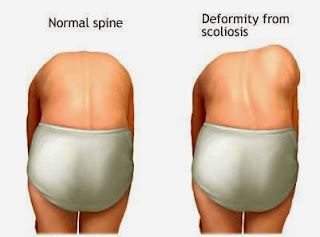 Degenerative scoliosis. This may result from traumatic (from an injury or illness) bone collapse, previous major back surgery, or osteoporosis (thining of the bones). People of all ages can have scoliosis, but this booklet focuses on children and adolescents. Of every 1,000 children, 3 to 5 develop spinal curves that are considered large enough to need treatment. Adolescent idiopathic scoliosis (scoliosis of unknown cause) is the most common type and occurs after the age of 10. 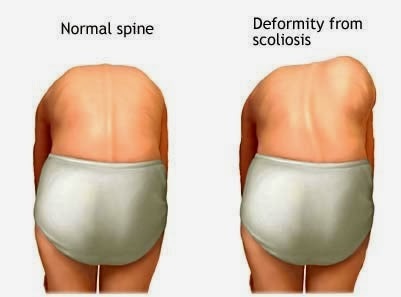 Girls are more likely than boys to have this type of scoliosis. 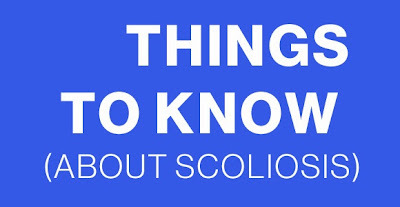 Since scoliosis can run in families, a child who has a parent, brother, or sister with idiopathic scoliosis should be checked regularly for scoliosis by the family physician. Idiopathic scoliosis can also occur in children younger than 10 years of age, but is very rare. Early onset or infantile idiopathic scoliosis occurs in children less than 3 years old. It is more common in Europe than in the United States. 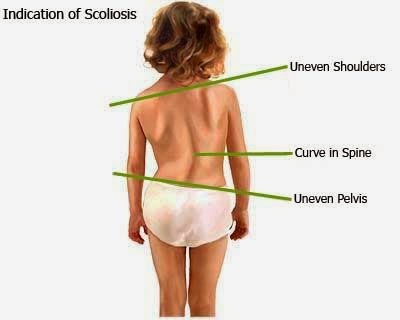 Juvenile idiopathic scoliosis occurs in children between the ages of 3 and 10. 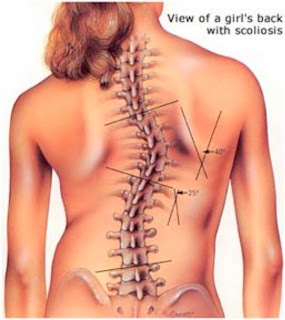 In most cases the onset of the scoliosis is gradual and painless. Scoliosis is usually noticeable on bending down. Sometimes a mild-to-moderate scoliosis can develop without being noticed by the child or his or her parents. This is often because the condition usually develops during adolescence when children often become more self-conscious. Parents and others are not likely to see a naked back and see the problem. If the scoliosis is in the thoracic (chest) region, the ribs and shoulder blade stick out like a bulge on one side of the back. Also, one shoulder may hang lower than the other and one shoulder blade may be higher than the other. If the scoliosis is in the lumbar (lower back) region, it can make the pelvis thrust forward on one side and one leg may appear to be shorter than the other. If scoliosis becomes severe and is not treated, it can cause problems later in life. For example, persistent back pain may develop and breathing problems or heart problems may develop if the deformity in the chest region is very severe. This is uncommon though. Go to your doctor if you notice signs or symptoms of scoliosis in your child. Mild curves, however, can develop without the parent or child knowing it because they appear gradually and usually don't cause pain. Occasionally, teachers, friends and sports teammates are the first to notice a child's scoliosis. How Does the Doctor Diagnose Scoliosis? The doctor talks to the patient and the patient's parent or parents and reviews the patient's records to look for medical problems that might be causing the spine to curve, for example, birth defects, trauma, or other disorders that can be associated with scoliosis. The doctor looks at the patient's back, chest, pelvis, legs, feet, and skin. The doctor checks if the patient's shoulders are level, whether the head is centered, and whether opposite sides of the body look level. The doctor also examines the back muscles while the patient is bending forward to see if one side of the rib cage is higher than the other. If there is a significant asymmetry (difference between opposite sides of the body), the doctor will refer the patient to an orthopaedic spine specialist (a doctor who has experience treating people with scoliosis). Certain changes in the skin, such as so-called café au lait (coffee-with-milk-colored) spots, can suggest that the scoliosis is caused by a birth defect. atients with significant spinal curves, unusual back pain, or signs of involvement of the central nervous system (brain and spinal cord) such as bowel and bladder control problems need to have an x ray. The x ray should be done with the patient standing with his or her back to the x-ray machine. The view is of the entire spine on one long (36-inch) film. Occasionally, doctors ask for more tests to see if there are other problems. The doctor measures the curve on the x-ray image. He or she finds the vertebrae at the beginning and end of the curve and measures the angle of the curve (see "Curve Patterns" diagram). Curves that are greater than 20 degrees require treatment. Doctors group curves of the spine by their location, shape, pattern, and cause. They use this information to decide how best to treat the scoliosis. To identify a curve's location, doctors find the apex of the curve (the vertebra within the curve that is the most off-center); the location of the apex is the "location" of the curve. A thoracic curve has its apex in the thoracic area (the part of the spine to which the ribs attach). A lumbar curve has its apex in the lower back. A thoracolumbar curve has its apex where the thoracic and lumbar vertebrae join. The curve usually is S- or C-shaped. Curves frequently follow patterns that have been studied in previous patients. The larger the curve is, the more likely it will progress (depending on the amount of growth remaining). Treatment of idiopathic scoliosis is based on the age when it develops. Adolescent idiopathic scoliosis is the most common form of scoliosis. If the curve is small when first diagnosed, it can be observed and followed with routine X-rays and measurements. If the curve stays below 25 degrees, no other treatment is needed. You may return to see the doctor every three to four months to check for any worsening of the curve. Additional X-rays may be repeated each year to obtain new measurements and check for progression of the curve. If the curve is between 25-40 degrees and you are still growing, a brace may be recommended. Bracing is not recommended for people who have finished growing. If the curve is greater than 40 degrees, then surgery may be recommended. As explained above, scoliosis is not typically associated with back pain. In cases with back pain, the symptoms can be lessened with physical therapy, massage, and exercises, including yoga. These can help to strengthen the muscles of the back. They are not, however, a cure for scoliosis and will not be able to correct the abnormal curve. There are several different types of braces available for scoliosis. Some need to be worn nearly 24 hours a day and are removed only for showering. Others can be worn only at night. The ability of a brace to work depends on the person following the instructions from the doctor and wearing the brace as directed. Braces are not designed to correct the curve. They are used to help slow or stop the curve from getting worse. If the curve stays below 40 degrees until the person is finished growing, it is not likely to get worse later in life. However, if the curve is greater than 40 degrees, it is likely to continue to get worse by 1-2 degrees each year for the rest of the person's life. If this is not prevented, the person could eventually be at risk for heart or lung problems. The goals of surgery for scoliosis are correcting and stabilizing the curve, reducing pain, and restoring a more normal curve and appearance to the spinal column. Surgery involves correcting the curve back to as close to normal as possible and performing a spinal fusion to hold it in place. This is done with a combination of screws, hooks, and rods that are attached to the bones of the spine to hold them in place. The surgeon places bone graft around the bones to be fused to get them to grow together and become solid. This prevents any further curvature in that portion of the spine. In most cases, the screws and rods will remain in your spine and not need to be removed. There are many different ways for your surgeon to perform the fusion surgery. It may be all performed from a single incision on the back of your spine or combined with another incision along your front or side. This decision is based on the location and severity of the curve. Surgery recovery varies some from person to person. Your doctor will use medications to control your pain initially after surgery. You will likely be up out of bed to a chair the first day after surgery. You will work with a physical therapist who will assist you in walking after the surgery. As you continue to recover, it is important to improve your muscle strength. The physical therapist can help you with exercises for your muscles that will also help with the pain. As with any surgery, there are risks of surgery for scoliosis. The amount of risk depends partially on your age, the degree of curve, the cause of the curve, and the amount of correction attempted. In most cases the surgeon will use a technique called neuromonitoring during surgery. This allows the surgeon to monitor the function of the spinal cord and nerves during surgery. If they are being placed at increased risk of damage, the surgeon is alerted and can adjust the procedure to reduce those risks. There is a small risk of infection with any surgery. This risk is decreased with the use of antibiotics, but it can still occur in some cases. Other potential risks include injury to nerve or blood vessels, bleeding, continued curve progression after surgery, broken rods or screws, and the need for further surgery. Each of these is rare. People with degenerative scoliosis will often have more complaints of back and leg pain. This is related to the arthritis in the back and possible compression of the nerve roots that lead to the legs. Nonoperative treatment including physical therapy, exercises, and gentle chiropractic can help relieve these symptoms in some cases. People who fail to improve with these treatments may benefit from surgery. X-rays and possible MRIs will be obtained to plan for surgery. The surgery could include only a decompression or removal of bone spurs that are compressing the nerves. In some cases, a fusion will be necessary to stabilize the spine and possibly correct the abnormal curve. Scoliosis cannot be prevented in all cases. To help maintain good health, children should be sure to eat a healthy diet, exercise daily, and get enough rest. Weight-bearing exercise, such as walking, running, soccer, basketball, and gymnastics can help children's bones stay strong, but has not been shown to prevent scoliosis or to reduce progression of the condition. If the Doctor Recommends Surgery, Which Procedure Is Best? Many surgical techniques can be used to correct the curves of scoliosis. The main surgical procedure is correction, stabilization, and fusion of the curve. 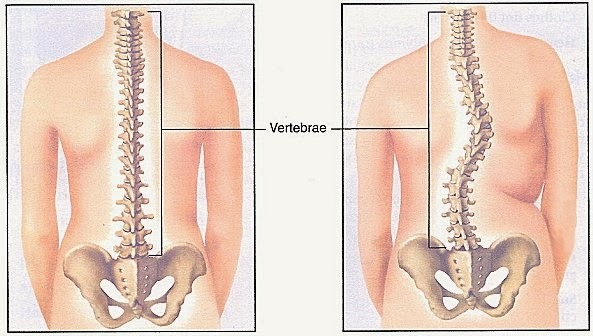 Fusion is the joining of two or more vertebrae. Surgeons can choose different ways to straighten the spine and also different implants to keep the spine stable after surgery. (Implants are devices that remain in the patient after surgery to keep the spine aligned.) The decision about the type of implant will depend on the cost; the size of the implant, which depends on the size of the patient; the shape of the implant; its safety; and the experience of the surgeon. Each patient should discuss his or her options with at least two experienced surgeons. What are the benefits from surgery for scoliosis? What are the risks from surgery for scoliosis? What techniques will be used for the surgery? What devices will be used to keep the spine stable after surgery? How straight will the patient's spine be after surgery? Is there chronic back pain after surgery for scoliosis? Will the patient's growth be limited? How flexible will the spine remain? Can the curve worsen or progress after surgery? Will additional surgery be likely? Will the patient be able to do all the things he or she wants to do following surgery? The decision about which brace to wear depends on the type of curve and whether the patient will follow the doctor's directions about how many hours a day to wear the brace. Milwaukee brace--Patients can wear this brace to correct any curve in the spine. This brace has a neck ring. Thoracolumbosacral orthosis (TLSO)--Patients can wear this brace to correct curves whose apex is at or below the eighth thoracic vertebra. The TLSO is an underarm brace, which means that it fits under the arm and around the rib cage, lower back, and hips. Can People with Scoliosis Exercise? Although exercise programs have not been shown to affect the natural history of scoliosis, exercise is encouraged in patients with scoliosis to minimize any potential decrease in functional ability over time. It is very important for all people, including those with scoliosis, to exercise and remain physically fit. Girls have a higher risk than boys of developing osteoporosis (a disorder that results in weak bones that can break easily) later in life. The risk of osteoporosis is reduced in women who exercise regularly all their lives; and weight-bearing exercise, such as walking, running, soccer, and gymnastics, increases bone density and helps prevent osteoporosis. For both boys and girls, exercising and participating in sports also improves their general sense of well-being. What Are Researchers Trying To Find Out About Scoliosis? Researchers are looking for the cause of idiopathic scoliosis. They have studied genetics, growth, structural and biochemical alterations in the discs and muscles, and central nervous system changes. The changes in the discs and muscles seem to be a result of scoliosis and not the cause. Scientists are still hopeful that studying changes in the central nervous system in people with idiopathic scoliosis may reveal a cause of this disorder. Researchers continue to examine how a variety of braces, surgical procedures, and surgical instruments can be used to straighten the spine or to prevent further curvature. They are also studying the long-term effects of a scoliosis fusion and the long-term effects of untreated scoliosis.